Born in Winnipeg, MacPherson started as a hockey referee and goal judge, and covered minor hockey for the Winnipeg Tribune. He went to England and started hockey broadcasting for the BBC in 1937. As a war correspondent, showman, sports commentator and author, his rise to fame in the UK included the Twenty Questions quiz show, Royal tours and coverage of World War II. He joined CBS Minneapolis (WCCO) in 1949 and returned to Winnipeg as public relations director and later as GM of the Winnipeg Enterprises Corporation. 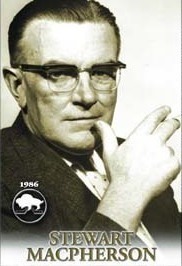 After managing the Winnipeg Arena, he joined CJAY-TV as program director (1960-74). Stew McPherson was named to the MSSA Media Roll of Honour in 1986.